Yeshivah Toras Emes-Kamenitz of Flatbush bid a tearful farewell to its Rosh Yeshivah of many decades, Harav Yaakov Zelinger, zt”l. The niftar was remembered for his selfless dedication to the Yeshivah that he served, as well as to its many talmidim. He was 70 years old. 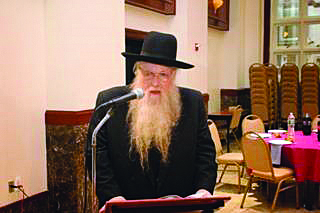 Rav Zelinger was born in 1946 and grew up in the Boro Park section of Brooklyn. His parents, Leo (Asher Lemel), z”l, and Bertha (Basha) Zelinger, a”h, were both involved in building up frum life in the neighborhood. Rav Zelinger was sent to Toras Emes’s elementary school and remained in the mosad for his entire life. He studied for many years, first as a bachur and later in kollel in Yeshivas Kamenetz under Harav Levi Krupenia, zt”l. The yeshivah operated for many years in Woodbridge, New York. In the late 1970’s, Rav Zelinger began delivering shiurim in the yeshivah, eventually assuming the role of Rosh Yeshivah. Despite his heavy responsibilities, he maintained an especially close connection with the many talmidim who passed through the mosad’s mesivta. For the first month of the year, he kept a seating chart on his shtender during davening so that he could learn all of the names of new students. Those who were privileged to know him recalled Rav Zelinger’s tremendous personal warmth, palpable simchas hachaim and natural ahavas haTorah. In his addresses to the yeshivah as well as in private conversations, Rav Zelinger exercised a particular skill for striking the appropriate chord with each bachur, understanding what he needed to hear to encourage his growth. Amidst his busy schedule, his desk was constantly strewn with sefarim that he could be typically found engrossed in at any time he could. When approached with a question on any of a plethora of Torah topics he often would carry on enthusiastic conversations, probing all angles of the issue for long periods of time. The levayah was held on Sunday afternoon at Yeshivah Toras Emes-Kamenitz and continued in Eretz Yisrael where an additional levayah and kevurah were planned to take place on Monday. He is survived by many children and grand-children. This article appeared in print on page 1 of the August 22nd, 2016 edition of Hamodia.